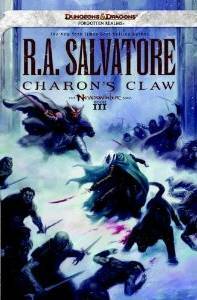 To celebrate the upcoming release of R.A. Salvatore’s Charon’s Claw on August 7th, Wizards of the Coast is thrilled to announce that Salvatore, a 24-time New York Times-bestselling author, will head out on a multi-city book tour this summer to meet fans and autograph copies of his newest novel. Additional details about Charon’s Claw and the D&D® suite of products can be found at DungeonsandDragons.com. About R.A. Salvatore – R.A. Salvatore is best known as the creator of the dark elf Drizzt, one of the fantasy genre’s most beloved characters. With over 17 million books sold and numerous game credits, Salvatore has become one of the most important figures in modern epic fantasy. His first published novel was The Crystal Shard in 1988, and since that time Salvatore has published more than 50 novels, with 24 New York Times bestsellers to his name, including The Halfling’s Gem, Sojourn, The Legacy and Neverwinter, Book II. For more information about R.A. Salvatore, please visit www.rasalvatore.com or find him on Facebook.